Mercedes-Benz has unveiled the new X5-rivalling GLE SUV ahead of its launch next spring. Built on an 80mm longer wheelbase, the new model gets extra space, especially in the rear, as well as a range of new engines. From launch it will be offered with a new in-line six-cylinder petrol featuring mild hybrid technology, offering 367hp with a further 22hp for short periods. Married up with four-wheel drive and nine-speed automatic, it’s said to offer up to 8.3l/100km official combined with CO2 emissions from 190g/km. Other engines including diesels and a plug-in hybrid “with a particularly long range” will follow. New technologies include the E-Active Body Control active suspension system which works in combination with the new air suspension to counteract body roll and pitching and squat – said to be a market first. 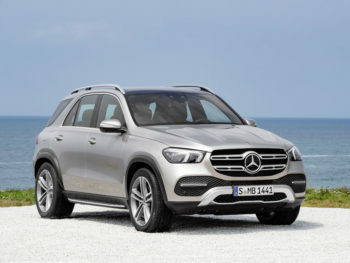 The GLE also debuts the latest generation of Mercedes-Benz driving assistance systems. The Active Distance Assist Distronic function with route-based speed adaptation enables the GLE to recognise and respond to tailbacks or slow-moving traffic with the help of information from LiveTraffic before the driver becomes aware of the hazard. If a tailback is recognised, it reduces the speed to around 100kph to enable the Active Brake Assist scope to brake the vehicle to a standstill in good time when the end of a tailback is recognised. On roads with lane markings, Active Stop-and-Go Assist also provides semi-automated driving to keep the vehicle in the lane and a safe stopping distance at speeds up to around 60kph. It also automatically starts moving up to one minute after coming to a stop if the vehicle ahead moves. Other changes introduce larger screens for the infotainment system, a full-colour head-up display with a resolution of 720 x 240 pixels and the MBUX Interior Assistant, which can recognise hand and arm movements and supports operating intentions. Pricing for the new GLE will be announced in the autumn, with first cars arriving in spring 2019.